Evil priests, a mage eating god, as well as mayhem and treachery at every turn are only part of what makes this steampunk tale great fun. Rexei is a young woman who has hidden her gender and mage abilities for years. Trying to maintain her gender identity as a male, she consequently earns a place in many of the guilds throughout the land as an apprentice; her most recent apprenticeship is with the stewards. She is sent to spy on the priests of Mekah, who have captured mages through the years and feeding the mage magic to their evil god. Through a series of events the power of the god disappears leaving the priesthood in chaos and the peoples of this country seeking a new beginning before the priests have the opportunity to establish an even more evil presence as their god. There is plenty of intrigue with wonderful world building and all of the fantastical machines that make this genre such fun to read. The characters are colorful and likable and even not having read prior installments in the series, it read very well as a standalone novel inspiring curiosity about what might have transpired prior to this work. There is a bit of humor and even a bit of a romance with some smexy goings on, which is tastefully written, for those who enjoy throwing this in the mix. 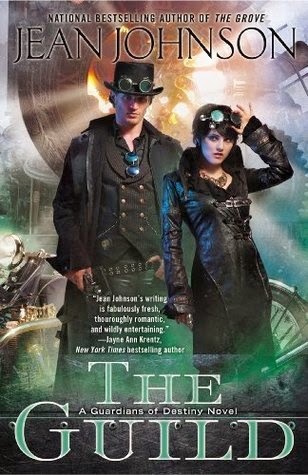 I enjoyed the story very much and seriously wish I had my own motor-horse, definitely a recommended read for adult steampunk fans. I'm gonna have to catch up with this new-to-me series! It sounds fantastic! I love everything Jean Johnson has written, she is amazing. Can't wait for this book to fall on my doormat. If you want to read the previous books, you should start with the Sons of Destiny series, although that is more romance perhaps, it is the build up for this spin off series, where more the world is explored. Especially the destroying of Mekha is explained in there.